Tailor-made for the family on the go, the 2017 Toyota Highlander is a favorite at Downeast Toyota. Available in six standard trim levels – LE, LE Plus, XLE, SE, Limited and Limited Platinum – the Toyota Highlander can make finding the right fit a tough decision for car shoppers. Take a closer look at two popular Highlander trim levels with this in-depth 2017 Toyota Highlander LE vs 2017 Toyota Highlander XLE trim level comparison at Downeast Toyota. A perfect fit for you and your family, the 2017 Toyota Highlander makes room for eight passengers in standard configurations with an available 83.7 cubic feet of cargo space. Upper trim levels add luxurious second-row captain's chairs and make room for seven. 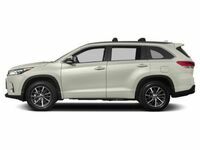 All Toyota Highlander models include standard Toyota Safety Sense technology that features a Pre-Collision System with Pedestrian Detection, Lane Departure Alert with Steering Assist, Dynamic Radar Cruise Control and Automatic High Beams that have made the Highlander an IIHS Top Safety Pick+. What Are the Differences Between the Toyota Highlander LE and Toyota Highlander XLE? Affordability is a key aspect for any family in search of a new SUV and it is an important element of this 2017 Toyota Highlander LE vs 2017 Toyota Highlander XLE comparison. With a starting price that stands at $30,630, the entry-level Highlander LE is the most affordable trim in the Toyota Highlander stable and is a value-packed edition. Equipped with a more powerful standard engine and wealth of high-end features, the Toyota Highlander XLE starts at $38,520. Make your day-to-day commute to and from football practice more exciting and get behind the wheel of the athletic 2017 Toyota Highlander. Stock Highlander LE trim levels play host to a standard 185-horsepower 2.7-liter four-cylinder engine paired with a six-speed automatic transmission that delivers plenty of thrills. An upgrade in performance is available with the all-new 298-horsepower 3.5-liter V-6 that gets married to a brand-new eight-speed Direct Shift automatic transmission and will achieve 21 mpg in the city and 27 mpg on the highway. Highlander LE and Highlander XLE models will amp up fuel economy with the available Hybrid Synergy Drive powertrain. Armed with a Direct-Injection 3.5-liter V-6 that is paired with a high-torque electric motor, the Highlander Hybrid will manufacture 306 horsepower. Married to a Continuously Variable Transmission, the Highlander Hybrid will deliver 30 mpg in the city and 28 mpg on the highway. An Electronic On-Demand All-Wheel Drive System takes performance to the next level when you opt for the Toyota Highlander Hybrid. If comfort and technology are at the top of your wish list, the Toyota Highlander will deliver on all counts. Toyota Highlander LE models incorporate premium fabric interior in a spacious, well-equipped cabin that features a standard Toyota Entune Audio 6.1-inch touchscreen display, an integrated rearview camera, Bluetooth connectivity and Siri® Eyes Free technology. 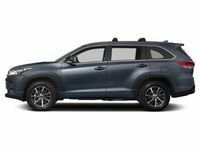 With leather and SofTex interior, the Toyota Highlander XLE provides a luxury-infused interior and amps up entertainment with an eight-inch Toyota Entune Premium Audio infotainment system that includes Integrated Navigation and App Suite. Heated front seats and Toyota Smart Key with push button start make the Highlander XLE a fan favorite.